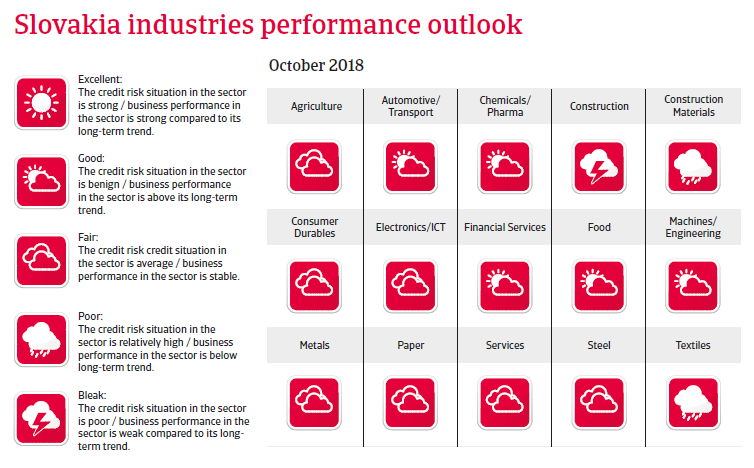 Economic growth is expected to remain robust in 2018 and 2019, but the economy is highly vulnerable to adverse developments in the automotive sector. Having served as Prime Minister for ten of the past 12 years, in March 2018 Robert Fico resigned after mass demonstrations against his government. The protests were triggered by the assassination of a journalist who was investigating alleged links between the administration and organised crime as well as cronyism within the governing social-democratic Smer-SD party. After Fico´s resignation it seems that the current coalition government (consisting of the Smer-SD, the nationalist SNS party and the liberal conservative Most-Híd party) is stable enough to remain in charge for the time being. However, any further revelation of corruption allegations and power abuse could lead to increased political instability and a snap election. Next general elections are due to be held in March 2020. Private consumption is forecast to continue to be one of the primary drivers of the economic expansion, supported by wage increases and growing employment. The unemployment rate has decreased from 14% in 2013 to 8% in 2017, and a further decline in 2018 is expected. Inflation forecast to stay at about 2% in 2018 and 2019, allowing real wage growth to continue. Investment growth is driven by EU funds, an increasing number of public-private partnership financed projects and the construction of a new Jaguar Land Rover plant. However, inefficient drawdown of EU funds limits even higher increases. 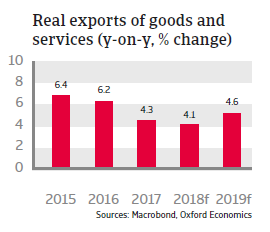 Exports are expected to grow more than 4% annually in 2018 and 2019, mainly driven by the favourable outlook of the automotive industry and persisting Eurozone demand (notably from Germany). Large foreign investments have increased productivity and export opportunities. The Slovakian banking sector is generally well-capitalised with strong liquidity, and the rate of non-performing loans has decreased since 2014. 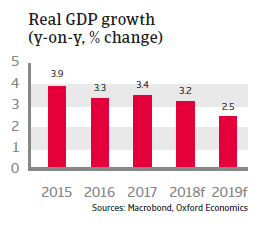 This reduces the risk of a negative shock from the current high domestic credit growth, which has been increasing faster than nominal GDP since 2015. Government finances are stable, with the budget deficit being kept below 3% of GDP since 2013. The deficit is expected to be kept around 1.5% of GDP in 2018 and 2019. Slovakia´s external economic position is solid. 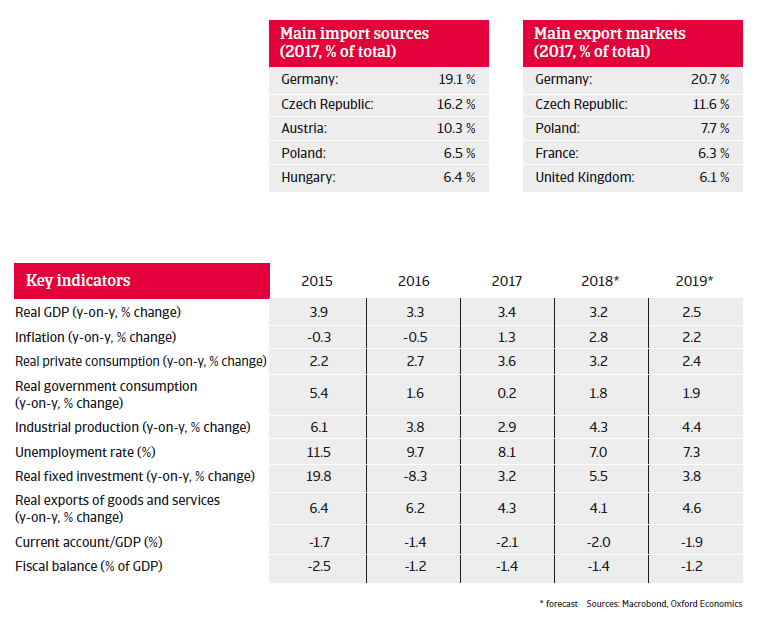 As the Slovakian economy is heavily reliant on industrial exports (especially automotive related) to the Eurozone, Germany in particular, it remains very vulnerable to a eurozone downturn and/or adverse developments in the automotive sector, such as potential US tariffs on car and car part imports from the EU. This would increase the credit risk of Slovakian businesses along the value chain. Other issues are increasing labour shortages and disadvantageous demographics (a shrinking working age population), which adversely affect Slovakia´s medium- to long-term growth prospects. Payment duration in the Slovakian automotive sector ranges from 45 to 90 days, and the payment experience has been good over the past two years.